Two studies in the April 27th issue of Current Biology offer rare glimpses into the ways that chimpanzees deal with the deaths of those closest to them. In one case, researchers describe the final hours and moment of death of an older female chimp living in a small group at a UK safari park as captured on video. In the other, researchers observed as two chimpanzee mothers in the wild carried their infants' mummified remains for a period of weeks after they were lost to a respiratory epidemic. "Several phenomena have at one time or another been considered as setting humans apart from other species: reasoning ability, language ability, tool use, cultural variation, and self-awareness, for example, but science has provided strong evidence that the boundaries between us and other species are nowhere near to being as clearly defined as many people used to think," said James Anderson of the University of Stirling in reference to his observations of the safari park chimps. "The awareness of death is another such psychological phenomenon. The findings we've described, along with other observations of how chimpanzees respond to dead and dying companions, indicate that their awareness of death is probably more highly developed than is often suggested. It may be related to their sense of self-awareness, shown through phenomena such as self-recognition and empathy towards others." 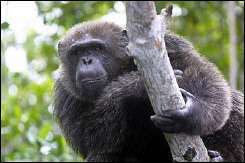 Few have witnessed chimps' response at the moment a member of their group dies, Anderson said. 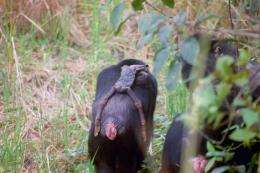 Mother chimps have been known to carry their dead infants, he said, and some observers have seen the commotion that follows when an adult chimp is lost to some sort of sudden trauma. "In contrast to the frenzied, noisy responses to traumatic adult deaths, the chimpanzees witnessing the female's death in our case were mostly calm," Anderson said. "In general, we found several similarities between the chimpanzees' behavior toward the dying female, and their behavior after her death, and some reactions of humans when faced with the demise of an elderly group member or relative, even though chimpanzees do not have religious beliefs or rituals surrounding death," Anderson said. Whatever the reasons for the chimps' actions, he added, they suggest that chimpanzees have a highly developed awareness of death. In the second study, Dora Biro of the University of Oxford and her colleagues witnessed the deaths of five members (including two infants) of a semi-isolated chimpanzee community that researchers have been studying for over three decades in the forests surrounding Bossou, Guinea. "We observed the deaths of two young infants—both from a flu-like respiratory ailment," Biro said. "In each case, our observations showed a remarkable response by chimpanzee mothers to the death of their infants: they continued to carry the corpses for weeks, even months, following death." In that time, the corpses mummified completely, and the mothers exhibited care of the bodies reminiscent of their treatment of live infants: they carried them everywhere during their daily activities, groomed them, and took them into their day and night nests during periods of rest. Over this extended period, they also began to "let go" of the infants gradually, Biro said. They allowed other individuals within the group to handle them more and more frequently and tolerated longer periods of separation from them, including instances where other infants and juveniles were allowed to carry off and play with the corpses. Other group members showed some interest in the bodies, but almost without exception, the other chimps showed no aversion toward the corpses. Biro noted that a member of her team made very similar observations following the death of one chimpanzee infant in Bossou back in 1992.
chimpanzees' responses to the passing of familiar or related individuals either in captivity or in the wild. Our observations confirm the existence of an extremely powerful bond between mothers and their offspring which can persist, remarkably, even after the death of the infant, and they further call for efforts to elucidate the extent to which chimpanzees understand and are affected by the death of a close relative or group-mate. This would both have implications for our understanding of the evolutionary origins of human perceptions of death and provide insights into the way chimpanzees interpret the world around them." More information: 1. Biro et al. : “Chimpanzee mothers at Bossou, Guinea carry the mummified remains of their dead infants.” Publishing in Current Biology 20, 8, April 27, 2010. Humans and chimpanzees, how similar are we?